We may soon see some new computers at the high school. Well, not soon enough for the seniors. The new computers may be in as soon at 2014 en masse, but the social studies department has already seen 30 or so computers. Some elementary and middle school teachers also have volunteered to take the computers for a test drive for the 2012-13 school year. At the recent Penn Manor School Board meeting, the plan for implementing new computers at Penn Manor’s schools was detailed, along with a new tax plan, and a rough outline of the solution to a diagnostic dilemma. What’s so different about the new laptops? They’re PCs. And they run Linux. 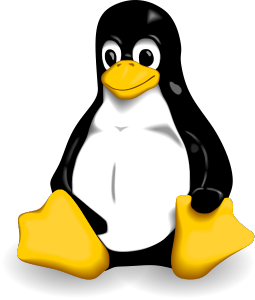 Linux is an open source, third party operating system separate from Windows or Mac. It runs closer to Windows in looks than the Mac OS, but it has gained popularity in the tech world for both its open source code (meaning that you can use it to help your computer do whatever you want it to do) and its adorable penguin mascot. The system would still be vulnerable to viruses, but with some patches and elbow grease, the worst of them might be avoided. “High school students are already beginning to see more PC laptops. We have a cart of 30 in the social studies department and another few batches in use for special projects. Don’t forget that PCs are utilized in Tech Ed and business classrooms, too. To give some perspective: Several years ago, Penn Manor High School was largely a PC/Windows building with only a few Macs,” said Charlie Reisinger, the Penn Manor Technology Director. According to Reisinger, the district would save a substantial amount of money by switching to the new operating system, which is offered free online. Windows and Apple licensing can cost a significant amount of the technology budget. The savings are surprising, “Penn Manor currently employs 620 Lenovo x120e ThinkPads running Ubuntu Linux and open source software. At a minimum, our open source program has saved over $70,000 versus an implementation of iPads or similar tablet technology. If we compare the cost of Ubuntu-powered ThinkPad netbooks against the price of a standard $900 MacBook, our savings are well over a quarter of a million dollars,” said the Tech Blog. Penn Manor is currently operating under an armada of Apple computers, but since Apple has discontinued its plastic Macbook that is currently used, the next closest option is the Macbook Pro. The Pro can run up to over a thousand dollars. The district is also looking to close the gap in the next few years between computer availability and the number of students. According to Reisinger, there are 1721 students at the high school, and 795 computers. That makes the student-to-computer ratio 2.16, compared to Marticville Middle School’s ratio of 1.39. That means that, while students will have the option of opting in for a paper report card, Penn Manor is moving to online, instant reports. Additionally, the IU in Lancaster County has discontinued their diagnostic kindergarten services class for the Susquehanna Valley.Penn Manor typically has 3 to 6 kindergarteners at any given year enrolled in our schools, and the closest class is in Manheim. Diagnostic kindergarteners are children with severe needs, such as children with autism or developmental disabilities. They can come with their own aids, and Pequea Elementary has had an existing class in the past. The choice for the school board was to bus 3-6 five-year- olds to Manheim — not a good solution for children living in the southern end — or to hire a new teacher and have our own class. Two additional aids would also have to be hired. The board voted to create the new class for the time being, until a more official vote could be made. The proposed cost to operate a class at Penn Manor is $117,480, and the cost to send the students to Manheim would be $151,856. The school board also voted on a tax hike of 1.6 percent to cover the proposed budget of $65,637,762. Penn Manor should expect changes to the way they use and learn technology. Who knows, maybe future students will be Linux masters. Show season is finally here! The sun shall shine and let the good times roll. Saturday April 28th will kick off the car show called Volksfest, rain or shine. The show will open up for vendors at 7 a.m and 8 a.m for show field and spectators. Registration ends at noon and awards will be given out at 3 p.m. Both spectators and vendors will have the opportunity to show their love and support for European cars. The show has had many great outcomes and plan to have yet another stellar year. The show consists of cars, vendors and people who love European autos. The weather looks to be be on the positive side for tomorrows car show and so do the students at Penn Manor. Senior David Burch is also attending the car show tomorrow and plans to tag along with his brother and friends. With that being said, the car show is a great place for a family fun event. There is no alcohol, pets or grills permitted. The car show is nothing but laughs, nice cars and a great time. All awards will be done for both Air Cooled & Water Cooled vehicles. 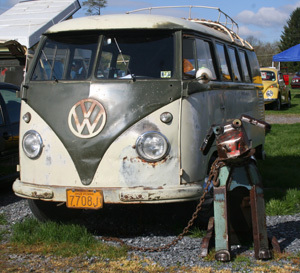 There will also be a Best of Show and Worst of Show Award for either Air Cooled or Water Cooled. Usually people were happy to have one car show, now there are several local ones. If you would like to know more information regarding Volksfest, check out their online site and feel free to contact them with questions or concerns. The Manheim community is not braking on teen driving issues but facing them straight on in an attempt to prevent another tragic injury or death. The Manheim area has lost eight teens to driving accidents over the past two years, so the Manheim Lions Club and its community partners have decided to promote a defensive driving program called BRAKES to teen drivers and their parents. “Some of the issues (accidents) are due to inexperience, and some are due to recklessness,” said BRAKES coordinator, Clayton Stitzel. BRAKES stands for Be Responsible and Keep Everyone Safe, and some parents at Penn Manor are all for the program. “Yea (I would recommend my kids to BRAKES), I get nervous sending them out there because of their inexperience,” said one parent who works at Penn Manor. “But I wouldn’t go because my kids get nervous with me in the car, rather than an instructor being with them,” said the parent. BRAKES was founded in 2008 by Doug Herbert after his two teenage sons were tragically lost in a car accident, according to the Lancaster New Era. Since then, more than 3,000 students from 19 different states and two countries have participated in the course. “It’s not us teaching a teen to drive rather than the parent; it’s a community-parent partnership,” said Stitzel. The club recently informed Donegal High School about BRAKES because they lost a teen to a vehicle accident not too long ago. 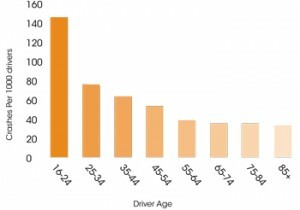 Although there have been numerous teenage deaths due to driving incidents. Those accidents don’t make some interested in programs like BRAKES. “I drive more cautiously after my accidents, not others,” said Nicole Harnish, a Penn Manor student. The course begins with a half-hour lecture, then the majority of the program is spent driving with an instructor, states Lancaster New Era. This course may perhaps would be more beneficial to teens than they really think. “My friends drive crazy,” said Teerney Nace, a student at Penn Manor. Teens will learn how to drive on wet-road recovery, off-road recovery, panic stopping, and distracted driving, states Stitzel. The BRAKES program will continue to be available to teen drivers and their parents. To participate in the course go to www.putonthebrakes.com and look for “Driving Schools” and “Schedule” tabs. After a brief battle with liver cancer, “Smokin Joe” Frazier passed away Nov. 7, 2011, a Monday night. Although his heydays ended long before students at Penn Manor were born, many have an abiding respect for the boxer. “I used to spend free time watching the Joe Frazier vs. Muhammad Ali trilogy of fights, and when I first heard he died I just didn’t know what to do. I almost wanted to cry,” said Brandon Schmertz a senior at Penn Manor. Frazier had one of the most decorated boxing careers, a career spanning from 1965 to 1976. He also reappeared with one comeback fight in 1981, and won a golden medal in the 1964 Olympic games for America in the heavyweight division. He was the undisputed heavyweight champion of the world between 1970 and 1973, until he lost to the much larger competitor George Foreman, in Jamaica on January 22, 1973. “My favorite fight of all time just so happens to be the “Thrilla in Manilla” [fight]. [That is] when Ali beat Frazier, but I give “Smokin Joe” a massive amount of respect for this fight. They went so many rounds it was just crazy, and with the passing of Joe Frazier, I think the greatest rivalry of all time finally ended last Monday,” said Brian Le, a Penn Manor senior. “Smokin Joe” is well known for his trio of fights against Muhammad Ali in the 1970s. Their first fight was the “Fight of the Century,” where “Smokin Joe” took on “The Greatest” Muhammad Ali. 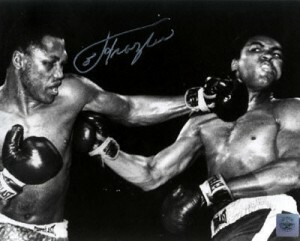 Then, during their rematch, Ali knocked out Joe. He also knocked out Joe in their final “Thrilla in Manilla” match. Joe was defeated once again in a close match against Ali. “I never really cared about boxing, but I remember seeing him fight Ali a few times, and I think he will be sorely missed,” said Nick Zell a senior at Penn Manor. Since his fights with Ali, Frazier has always been living in Ali’s shadow. Joe never actually forgave Ali for all the things he said about him until 2000s. “I’m sad to hear that he passed, but I really won’t need any tissues over his passing,” said Officer Jason Hottenstein, the Penn Manor school resources officer. 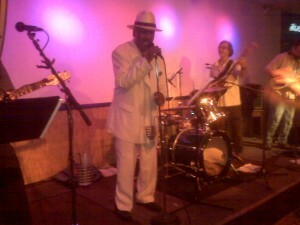 Joe Frazier singing in a bar Taken by Christine Harvey. Frazier’s funeral proceeding is going to be held at the Well’s Fargo Center. The fact that the Well’s Fargo center would allow a viewing to be held at its arena is just a testament to how famous Joe Frazier is. Also, it goes to show how much he influenced the lives and minds of millions of American’s over the span of his life time. Even Ali and Larry Holmes are attending the funeral of the long time rival. Then there is the fact that Floyd Mayweather offered to pay for Joe Frazier’s funeral out of his own pocket. He wants to help Frazier’s family out with the death costs and demands of such a sports superstar. There are two public viewings for the people to pay their respects to Joe at the Well’s Fargo Center on Friday Nov. 11, between 10 in the morning to five in the afternoon. There will be another viewing on Saturday, Nov. 12, between 10 in the morning and one in the afternoon. Frazier will be missed and remembered by all who enjoy boxing as a sport. His legacy will live on forever and his achievements will be talked about for years to come. Through the wind, rain and snow, the Millersville paraded on. The Millersville Parade is an annual community event to bring together Millersville Borough, Millersville University and the surrounding communities. This year’s theme is “Our American Heritage,” celebrating Millersville’s 250th anniversary. Even with a 90 percent chance of precipitation and a possible 4-6 inches of snow fall, the parade marched on. 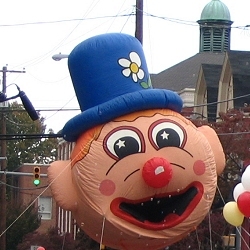 A balloon from the Millersville Parade. Photo Courtesy of Millersville Parade website. Student worker Jennifer Vataha said there was little doubt the parade would go on in spite of the weather. All parade entries and bands are still in, except for Penn Manors own marching unit because of the snow. Director Tom Mumma was not around for a comment. For more information on the parade, visit http://parade.millersville.edu/, or call the parade hotline at 717-871-2213. While students rock the latest trends, Penn Manor teachers have developed a fad of their own. Teachers at Penn Manor pay a small fee ranging from $5 to $10 to dress in more laid-back clothing. The proceeds raised from these days are donated to various charities or school related clubs or activities. But it’s not all fun and games since the number of “dress down” days has reached an all time high and the price for all the giving and casual wear can add up. “There are definitely more [dress down days] now than there were five years ago,” said teacher John Erisman. Each week is for a different cause. Those who wish to collect the proceeds propose their plan for the money to the school administration. Principal Phil Gale and the administration have the final say as to who runs each casual Friday. “It’s always for a school-related club or activity, or for an organization,” said Gale. 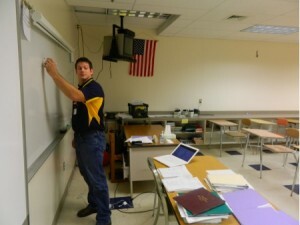 Math teacher Mike Fowler teaching in a comfortable pair of jeans. Photo by Mark Dano. With many quality places to donate money, these days occur frequently. There have been a couple of these days so far this year. “There’s been one for post-prom, one for the football team and one with the field hockey team for breast cancer,” said Gale. There are two reasons that most teachers choose to participate in these days. Not participating has became a fashion faux-pas among teachers. With the increasing number of dress down days, some teachers have cut back their participation. Even though he dresses down on Casual Friday, Fox can understand why some teachers may choose not to. Nonetheless, these days have had much success and will continue throughout the year. It was a day to make a difference for those battling the second leading cause in cancer death: breast cancer. 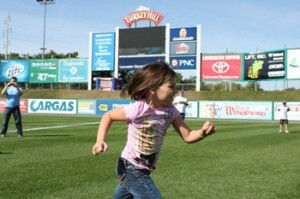 Penn Manor High School’s cheerleaders and boy’s soccer players volunteered their time Saturday morning by participating in a Kick Cancer Kickball game for Help The Fight Foundation at Clipper Magazine Stadium Saturday, September 17. Barnstormer’s Cylo the cow and Penn Manor’s Comet Man both made appearances the day of the event. The cheerleading program welcomed the crowd first thing in the morning with a welcome cheer and continued their spirit lifting by cheering on the Kick Cancer Kickball game. While the soccer team volunteered to work the game by pitching the kickball, playing the bases and running the bases for those who were physically unable or preferred not to run. Help The Fight Foundation started in 2009 when founders David and Lynda Charles’ relative was diagnosed. Lynda Charles had lost her mother to Breast Cancer 19 years prior to the first annual event in 2009. Help The Fight is affiliated with Lancaster General Health Foundation. 80 percent of the the proceeds go to patients currently undergoing treatment for anything from medicine, to rent, even child daycare. The other 20 percent goes to those unable to afford proper screening to detect breast cancer – the primary reason most women (and men) are diagnosed. Help The Fight is known as Lancaster County’s largest bake sale. The event this year also offered over 125 raffle items, silent and live auctions and hourly 50-50. Help The Fight raised over $25,000 this past year. 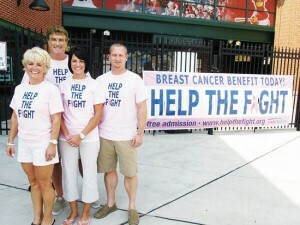 For more information on Help The Fight and other events, visit www.helpthefight.org and like it on Facebook. Penn Manor rocketeers strive to repeat. On May 14th Penn Manor Rocket club will send six different rocket teams to Manassas, Virginia to compete in the Team America Rocketry Challenge, otherwise known as Rocket Nationals. The team claimed the title last year and looks to retain it once again this year. Since February, the 25 students of Penn Manor High School and Marticville Middle School have been launching their rockets at Manor middle to try and reach the exact height and the amount of time they have been putting so much effort in for. “I can certainly testify to the commitment and hard work these kids have put forth on the weekends at Manor Middle,” said Brian Osmolinski, adviser of the Rocket Club. This year the Rocket Club will have a high of six teams going to compete at Nationals. This is new to the club and has never been tried before. Team 1: Alex Cauler, Mark Raymond, David Herr, and Jonathan Martin. Team 2: Maggie McClintock, Jesse Burkholder, Eric Keefer, Jake Schick, and Ian Tahmasbi. Team 3: Andrew Lobos, Cate Shipley, Gabbie Bauman, and Chris Cuascut. Team 4: Lars Anderson, Peter Ashworth, Haley Blazer, and Alec O’Rourke. Team 5: Zach Kauffman, Brendan Woods, and Eric McMahan. Team 6: Jesse Stoner, Tom Sowers, Wyatt Shiffler, Curtis Herr, and Shawn Stone. With all of these different teams to judge for Penn Manor, the likeliness of winning nationals once more is much higher. These higher odds go along with the high expectations. Tomorrow, the Penn Manor students who are competing in this contest, will travel to Manassas and try and meet those expectations. Happy birthday to you, Millersville. Over 100 community members were present at Millersville University’s Pucillo gym Saturday for the kick-off ‘Dancing Through the Decades’ event, celebrating the 250-year-old town of Millersville. Christina McSherry in a replica ballgown she created.. Guests flocked to a corner of the room around 6:45 p.m. when Mauro Castano, famous chef and cake designer from TLC’s Cake Boss, arrived to present an elaborate cake designed by Carlo’s Bake Shop. Castano posed with committee members and guests for pictures before taking the stage to give a heartfelt speech. “I always tell people events like this make America what it is. It’s you guys,” said Castano. Castano explained that the cake was “a little bit of the old and the new,” portraying a street scene of the town. “You don’t look a day over 195,” said Boyd, spreading smiles throughout the room. Boyd also presented a framed replica of a map kept in the state archives of a birds-eye view of Millersville, drawn in 1895. Other featured speakers included mayor Richard Moriarty and amicable anniversary co-chairs Steven DiGuiseppe and Mary Ann Gerber, both dressed in historic costumes. While guests watched the unveiling of the cake and listened intently to speakers, dancers were preparing in the hallway. Exhibition ballroom dancers Barbara Snyder, Ken Wilson, Deborah Paparo, and Leraunt VanLool said they rehearsed for forty grueling hours together before their performance at the event. The four dancers performed dances that reflected different time periods such as the waltz, charleston, quickstep, foxtrot, swing, hustle and rumba, complete with costumes and festive music. “Those dresses are gorgeous!” said Penn Manor National Honors Society member Kaykey Gaukler. “Now when people go out they just wear tight pants and short shirts,” she said with a laugh. the waltz to the “YMCA”, community members enjoyed dancing through the decades under the glittering disco ball. After a large meal and cheerful dancing, guests crowded outside for a majestic display of fireworks. According to committee members, the event went smoothly and was entertaining for guests. This great kick-off event, leading the celebration of Millersville, could not have been possible without the many volunteers and the businesses that donated time and money to plan the anniversary events throughout the year. Leave the trash talking on the court. A basketball tournament is being held at the high school to promote awareness of bullying. On Sunday, March 27, at 12 p.m., the Penn Manor Varsity Club is set to hold a co-ed 3 v 3 basketball tournament in the East Gym. The event is open to students in grades 9-12, the faculty and the surrounding Penn Manor community. One thing that Marsh wants is to open the event to more than just Penn Manor students. Dan Elliot, a senior Varsity Club member and volunteer for the event, is looking for students to participate. One of the teachers, Erick Dutchess, has his hopes high on, as he said, “utterly decimating” the competition in the tournament. How’s that for talking smack? Along with the 3 v 3 tournament going on, there are also plenty of other things to do.